Some recent posts on our synergy-l listserv made me realize there are still some misperceptions about Microsoft network shares (mapped drives), so I thought I would address those here. Microsoft designed network shares for single-user access to shared resources such as Word documents. The locking and caching algorithms they use assume that a local cache is desirable since multiple users are unlikely to do concurrent updates (though the algorithms try to cope with this situation). Of course the use of network shares has grown to much more than single-user systems. Many of our customers have used them and are still using them, and many of these customers have unfortunately encountered performance and file corruption issues. Most of these issues are associated with concurrent updates and cache flushing, and using mapped drives (as opposed to UNC paths) seems to exacerbate the problem. With older Windows versions–prior to Vista and Server 2008–you can mitigate file corruption issues by disabling oplocks on the server (which disables the local caching). (Syncksys, a utility we used to check settings on these older Windows systems, always checked for this.) Unfortunately, you can’t disable oplocks with SMB2 redirectors on the newer Windows systems. Because of the number of issues our customers have encountered, Synergex can provide only very limited support for Synergy database access through network shares. (See the Synergex KnowledgeBase article listed below.) We have traced these problems to errors in the Microsoft SMB (mrxsmb10.sys, mrxsmb20.sys, mrxsmb.sys) and Redirector (rdbss.sys, srv.sys) subsystems. We find that these problems get worse with network shares over a WAN and with multi-user access. It is fair to say that Microsoft has fixed many problems with Windows XP and Server 2003 over the years, but the problems have resurfaced with newer Windows operating systems. And now many organizations are using Windows Vista and Windows 7 machines as clients (alongside their Windows XP clients) to Server 2003 or Server 2008 servers, introducing newer operating systems with mapped drive subsystems that have regressed in functionality and performance. We recently (and mistakenly) used a mapped drive internally for a project, and the ISAM files for the project were continually corrupted. (We have logged a premier support call to Microsoft for this issue.) We fixed the corruption with the recommended solution, xfServer, which not only solved the issue but improved performance. File corruption issues aside, in most cases xfServer will significantly outperform a mapped drive in commercial situations with multi-user access when it’s set up to correctly use SCSCOMPR and SCSPREFETCH in conjunction with correctly opening files for input when just reading data sequentially. 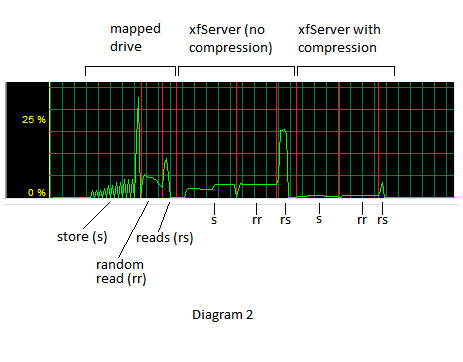 The known cases where xfServer is slower than a mapped drive is when a file is opened for update with a single user or exclusive access, or for output when the file is not large and/or the records are small (or ISAM compression makes them small), allowing the redirector to cache the data blocks locally. If oplocks are turned off on Server 2003, as recommended, this caching is disabled and performance degrades, though reliability increases. We are investigating an xfServer performance improvement that would provide comparable or better performance than a mapped drive in additional scenarios by allowing users to enable the cache on stores and writes to a file opened for output, append, or exclusive access. We have provided a test utility in CodeExchange, IsamBenchMark, to help you test performance with your own physical files and network. Using this utility, we saw the results described below. The following tests were made on a Windows 7 machine connected to another Windows 7 machine over a 1 GB network. The machines each had 6 GB of memory and Core 2 3GHz CPUs. The Windows operating system cache was flushed using the Sysinternals CacheSet utility before each run on the server machine. Neither machine had an antivirus program running or any other software that accessed the network. Both machines were connected on the same physical switch. Two files were used: one with eight keys and 128-byte records and the other with eight keys and 512-byte records. Each file was filled with 100,000 records during the test, and the files were created without ISAM file compression. We used Task Manager’s networking tab to generate the diagrams below (though we’ve added red vertical lines in one diagram). Diagram 1 shows network overhead for our first test, which used xfServer to access the file with 512-byte records. The file was first accessed without compression and then with compression (i.e., with SCSCOMPR set). Using 4-5% of a gig link is equivalent to 50% of a 100 MB Ethernet, so the performance gained by setting compression for xfServer would be even greater on a slower Ethernet or WAN. The test program stored 100,000 records, re-opened and used random read for 100,000 records, re-opened and used reads for 100,000 records. Note the change in scale from the previous diagram, and note the overhead of the stores is high (with the flush-on-close peaking with the mapped drive). The next segment is the random read, and then the next peak is the reads. Also notice the setup with SCSCOMPR and SCSPREFETCH makes the reads almost as fast as a local disk access and far faster than the mapped drive. If this had occurred over a slower network, the stores would be slower on a mapped drive than xfServer and the SCSCOMPR form would outperform all other methods, given records with some degree of compression. If you have an ISAM file with ISAM compression, isutl –v can give you an idea of how much compression of the data can help with xfServer. Diagram 3 shows network overhead when accessing the file with 128-byte records in the same three ways (mapped drive, xfServer without compression, and then xfServer with compression) and with the same program. Diagram 4 shows the network overhead for… Well, there is no diagram 4. Our final test used two systems each with the remote 512-byte-record file opened on the network share. One just had the file open. The other ran the test. 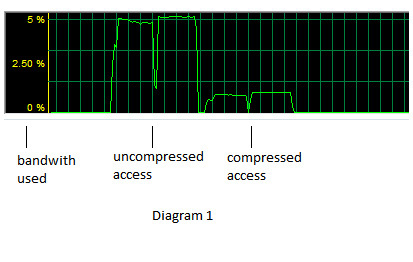 This setup used 50 MB of bandwidth constantly for several minutes, so the diagram would run off the page and would show only a pegged green line. Instead, here’s a table that summarizes our findings. The last row documents the results for the multi-user mapped drive setup and illustrates how much worse things get when using a mapped drive in a multi-user environment. Bandwidth is quickly overloaded, and it becomes difficult and time consuming for the network to accommodate large groups of packets. As pointed out earlier, these tests used a physical switch. xfServer becomes even more important when the network involves a hub. One final thing to be gleaned from this is that running programs that transfer large amounts of data across a network, programs such as month-end or day-end processing or reports, can quickly overload a network. Do what you can on the server by using xfServerPlus, the new Synergy Language Select class, or by running the program on the server. If your xfServer system is not performing in line with the results described above, I encourage you to contact our Developer Support team so we can assist you in optimizing your system. If you have questions or would like more information on this topic, contact Synergy/DE Developer Support or your account manager. On this topic, a customer recently reported an ELOAD/System error 64, “The specified network name is no longer available.” When they changed the UNC path to use the IP address rather than the name of the machine, the problem appeared to be resolved. This would suggest poor DNS server performance lookups was causing the error. It appeared the problem was disconnecting client machines on the network, as well as the recovery mechanism used by the re-director after such a failure. In the recovery mechanism, it appears DNS must also work. The problem with DNS is that Microsoft caches “Failures” of DNS, so one failure can cause other issues.